ECB president Jean-Claude Trichet was quite complacent at the last council meeting. And for the first time since the beginning of what was first called subprime, then credit crunch, only to morph into a recession by now, markets seem to agree with Trichet. There is a glimmer at the far off end of the tunnel of hope. 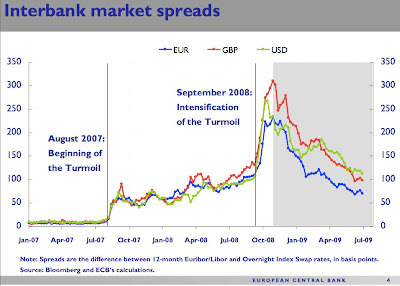 Euro interbank markets spreads are currently the lowest in a comparison with Federal Reserve Notes and Pound Sterling, Trichet was happy to tell an audience at the University of Munich on Monday. GRAPH: Mr. Market says there is less stress in the system than there was last year. The long term picture leaves a lot to desire, though. Chart courtesy of ECB. And now, if you really got nothing better to do than waiting on the FOMC minutes due today, read Trichet's speech here. UPDATE: FT Alphaville writer Izabella Kaminska has done the work for all on such a humid summer day. Click here for her excerpts from Trichet's speech, covering the ECB's rubbish in its portfolio,, i.e. "Other assets."